The Alpine American Little League Astros won the District 41 Majors Brian Fitzgerald Memorial Tournament of Champions for the first time in league history by defeating the Lakeside National Yankees, 2-0, on Saturday. Astros’ left-hander Liam Ouellette struck out seven over five innings as AALL won just its second district banner ever in any division, completing an undefeated regular season and postseason. The Astros scored its first run in the fourth inning when a pitch bounced and went to the backstop, allowing John Dyke to come in from third. Moments later, the Astros’ Ryan Rios dropped a hit behind first base that resulted in an RBI double, scoring Liam Ouellette for a 2-0 lead. The Yankees had a potential rally early in the contest when a single to center moved a runner to third, but Alpine center fielder Simon Price’s throw to third was relayed to second by third baseman Audrey Smale in time to shortstop Kade Gaier to get the LN hitter trying to advance on the play to end the inning. Alpine American, the tournament host, advanced to the semi by defeating Singing Hills on Monday. The Yankees defeated the El Cajon National Hurricanes, 12-0, on Thursday in the semifinals behind Ashton McCurty, who hit a three-run home run and struck out nine on the mound. Lakeside American’s Austin Cordiero drove in a pair of runs with a single to center, scoring McCurty and Andrew Conyers for a 5-0 lead in the third inning. McCurty blasted his home run in the fourth inning to the left of center field. The Yankees won, 8-4, over Santana National on Tuesday for their second-straight win in the ToC, after opening the tourney with a win over rival Lakeside National. In the win over SNLL, McCurty struck out the side in the top of the first, then hit a long two-run homer to center in the bottom of the inning, however, the Angels regained the lead early. Cordiero had a two-run single in the third to score McCurty (double) and Conyers to re-take the lead. Chance LaChappa recorded key outs on the mound in both of the Yanks’ wins. Meanwhile, the undefeated Rancho San Diego Padres captured the District 41 Minor Tournament of Champions title on Saturday at Santee Pioneer Little League. 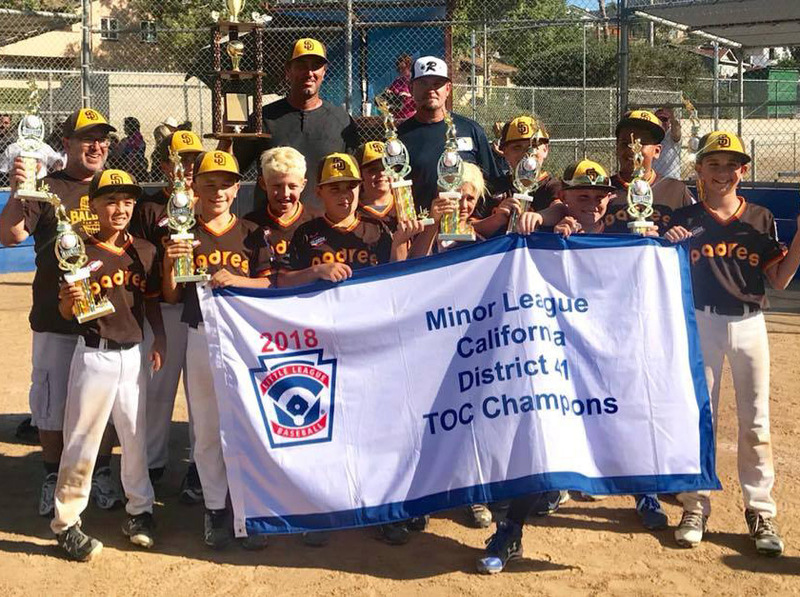 District 66 Spring Valley Little League captured the District 66 ToC hardware for the second-straight year, as the Astros defeated the Encanto Little League Tigers, 10-3, on Saturday. Astros slugger Julian Young hit a three-run home run to left field in the bottom of the fifth inning to snap a 3-all tie. Justin Tucker went the distance to get the win for SVLL. Tucker also doubled to left to score Juan Grijalva in the bottom of the first to tie the game at 1-all. The tournament host Astros won a big semifinal showdown with the previously unbeaten Lemon Grove Dodgers, 10-2, behind a long solo home run to right from Young in the first inning and the complete-game pitching effort of Nathan Shimko. 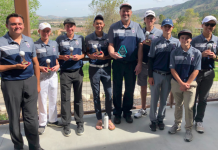 Spring Valley also won the District 66 Junior ToC championship with a 9-5 win over Encanto on Saturday ending Twin Hills’ three-year title run. District 33 The Lake Murray Little League Cubs squared off with their league rival, the Lake Murray White Sox, in a District 33 Majors Tournament of Champions quarterfinal on Monday at Sunset Park, as the Cubs’ Dominic Jones hit a solo home run to straight-away center field in the second inning for the only run of the game in a 1-0 win. The Cubs’ Isaac Lawson struck out the side in the sixth inning to secure the shutout against the Sox, who went 3-0 in pool play. Cubs left fielder Porter Riley made a charging, diving catch in left field in the first inning to end an early threat with two on. The Cubs host Tierrasanta on Tuesday with a berth in the district final on the line. The San Carlos Indians advanced to Tuesday’s other semifinal by defeating the Rolando Red Sox, 8-3 La Mesa National Nationals, 6-1, as Koa Altmeyer cracked a home run in the fourth inning. Altmeyer opened the scoring with an RBI single to center field in the first inning, as San Carlos took a 3-0 lead. Tyler Wick added an RBI double to centerfield in the fourth for SCLL. 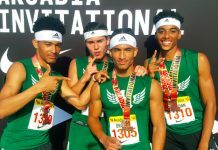 San Carlos meets Tierrasanta on Tuesday. The Indians’ Jack Giordano hit a grand slam in pool play, while Altmeyer homered in a 6-1 pool-play win at La Mesa National, as San Carlos went 3-0 to finish one game ahead of the Cubs. San Carlos knocked off the Lake Murray Cubs, 14-1, in the final game of pool play. Thursday’s district final will be held at La Mesa National at 5:30. Meanwhile, the San Carlos Little League Danger Zone has gone 4-0 at D33 Minor League ToC, earning a spot in Tuesday’s semifinals. San Carlos’ Cole Richardson hit his first-ever home run in a 14-1 pool-play win over Kearny Mesa LL.